Cadence Lodge opened as the Winkelmann Motel in 1957 offering people the chance to escape the summer heat of the city and find rest and relaxation in the Adirondacks. This place is like a “home away from home.” The rooms were clean, perhaps not the most modern but totally comfortable. The breakfast (served only during week ends) was so hardy with fresh fruits, yogurt, muffins, hard boiled eggs, chia seeds and natural peanut butter. The husband-wife team friendly and easy to engage into a conversation. This lodge is truly a gem tucked away near Whiteface Mountain. Can’t say enough good things about this place!! Extremely friendly staff and are willing to assist you with any help or questions you have. A very bike-friendly atmosphere, we were able to wash off our bikes at the end of the day and also they are working towards a tuning shed for bikes and skis. At night they have a fire pit with nice chairs which is great for the chilly nights. A short walk or drive to anywhere. 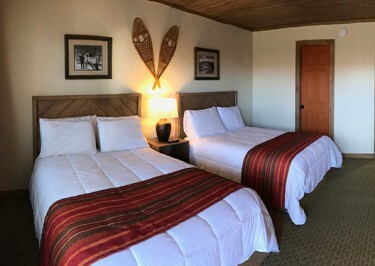 A true Adirondack lodge experience. We can’t wait to come back for another relaxing weekend! Great little hotel in a little town. The motel staff was sweet and soooo nice! We had to check in late and so I called in and since we were going hiking in the am the receptionist said she can put some breakfast items for us in the fridge ( since it was the weekend and they have continental breakfast on weekends only). They just went above and beyond with that sweet gesture. Nice location… they even have a firepit outside at night so you can join everyone by the fire. Great cozy place. The rooms were not anything special, just average, but service, hospitality and cleanliness was an A+.